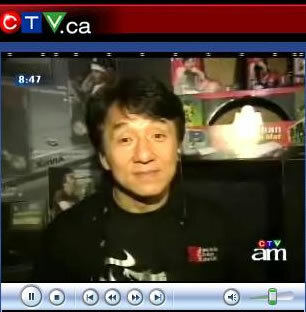 Check This Out: Jackie Chan Toys! 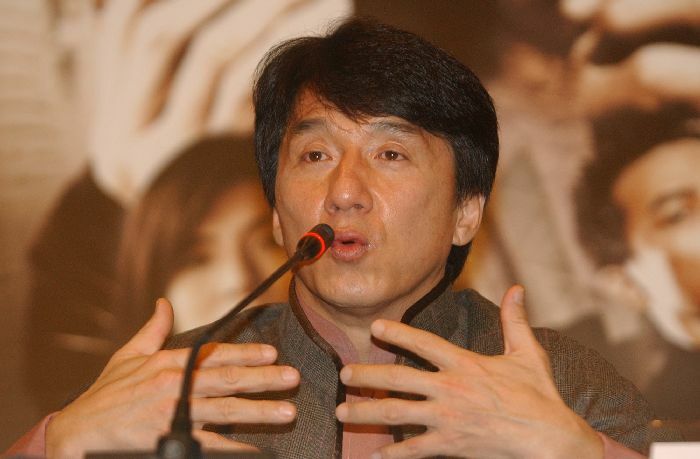 There appears to be a new series of toys in production featuring our own hero Jackie Chan! Check out these photos (with information). No word yet on when or where these will be available for purchase! found in any other Jackie Chan Action figures. connection when gathering with families. 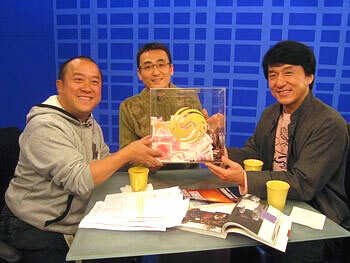 Jackie Attends "Book Art Exhibition"
Jackie Chan Martial Arts University? 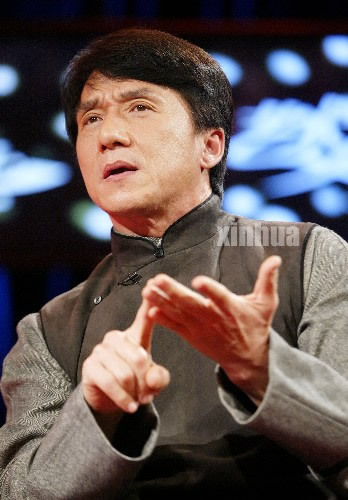 According to a Chinese news source (news.ent.tom), Jackie will be heading to Beijing next week to participate in the CCTV's popular Spring Festival (on February 2) and on the way there he will be inspecting sites for a future Institute of Movie Martial Arts. Jackie has looked around in Shanghai and in Beijing for a good place to build this school. Jackie wants this institute to be a place were there would be dormitories, dining rooms, and martial arts exercise and training rooms. He is hoping to attract future martial arts stars from all over the world. His vision for the school includes film editing classes, music, and performances. He hopes to complete this project in the next two years. The survey will run just a few more days, so if you haven't taken it, please do so now! It only takes a minute and it will be much appreciated. There are places for you to put your comments and suggestions and the survey does not ask for your identity. Click here! Thank you for helping the Kids Corner improve by taking this quick survey. The Hong Kong Film Critic Association's 10th Annual Golden Bauhinia Award committee has announced its nominations and Jackie has been nominated for his work in New Police Story! Congratulations to Jackie for this honor (and good luck). Eric Tsang, Dou Wen-Tao (? ), and Jackie with the donation box. Jackie met yesterday with Eric Tsang and Dou Wen-Tao (?) to discuss the results of the fund raising for tsunami victims. The January 7th "Crossing Borders" concert earned over HK$40 million and money continues to come in. Donation boxes are filling up all over Hong Kong. 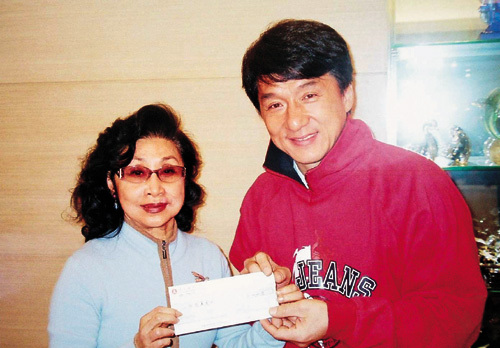 Jackie expressed his pride in his hometown and said that he was thrilled that Hong Kong stepped forward immediately and began donating money in great amounts - setting the example for the rest of the world to follow. Eric Tsang encouraged people to treasure what they have because a natural disaster like the tsunami could take it all away in an instant. The money collected by the charity events will be distributed to five organizations: The United Nations Children's Fund, Salvation Army Hong Kong, the Hong Kong Red Cross, and two others (which don't translate). 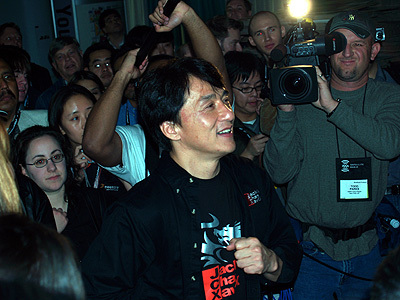 While Jackie was in South Korea, he surprised a lot of people by appearing at a show where he had a booth that sold many of his own "Dragon" designs. According to Oriental Daily, Jackie was displaying clothes, shoes and socks, and all kinds of souvenirs plus a portable telephone set, "Dragon" soy sauce, and even "Dragon" hot pepper sauce. Jackie modeled some of his own wares and even bought a t-shirt with "Peace" written on the front! Jackie seems to be an endless source of fascination for S. Koreans. Here are a few more photos from new conferences, etc. that you might not have seen before (many of them are just similar poses to photos that have already shown up here). All photos are from Korean Yahoo! PARDON THE WEBMASTER IF ANY OF THESE PHOTOS ARE "REPEATS." Thanks to everyone who submitted a t-shirt design. Thanks also to everyone who voted! All designs will be mailed to Jackie in Hong Kong so he can have a look at them! 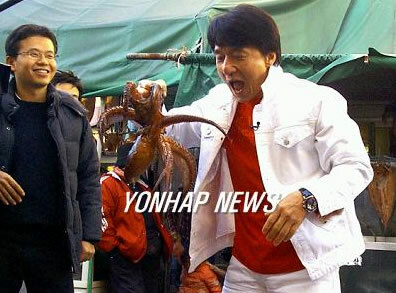 Jackie is extremely popular in South Korea. This is evidenced by the intense media coverage of his recent trip there. Here are links to two really nice videos of Jackie's visit. One shows him at the ribbon cutting ceremony of a Jackie's Kitchen and the other is a more general video showing clips from some of his movies and other highlights of his visit. 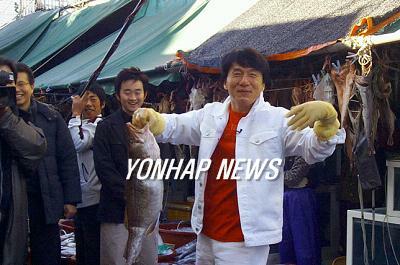 While searching around the Korean news sites, the webmaster came across some great old photos of Jackie - some very rare. Check them out here. 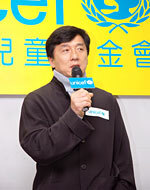 Jackie's New Police Story co-star, Charlie Yeung, attended a charity event press conference as the UNICEF Education Ambassador. The event will help Mainland children to return to school. On the 26th she will travel to Sri Lanka to visit orphans who have lost their families in the tsunami disaster. Thanks to all of you who have taken the Kids Corner survey. Your comments and suggestions will be read and responded to as soon as enough people have checked in. If you haven't taken the survey, please (PLEASE!) do so now. You do not identify yourself on this survey, and it only takes about a minute. The more people who send in their comments and opinions, the better this site will be. Click here to take the Kids Corner Survey. Jackie interacts with the local sea life. Kim Hee-Sun and JC with local children. Thanks to Sina Hirt from Buddy Bears Berlin for sending the Kids Corner the Buddy Bear Newsletter. 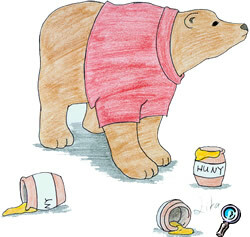 It's very exciting to read - it even shows that Queen Elizabeth is a Buddy Bear fan! Click below to read the newsletter. Find out what Queen Elizabeth II is doing with this Buddy Bear! Just read the newsletter. 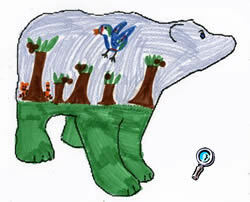 If you would like to add your Buddy Bear design to the galleries of bears here on the Kids Corner, just click here. The Kids Corner has gotten Buddy Bears from many countries all over the world, but we haven't gotten many from Asia. So how about it? Hey all you kids in Japan, China, India, and everywhere else in the world - send in your Buddy Bears! 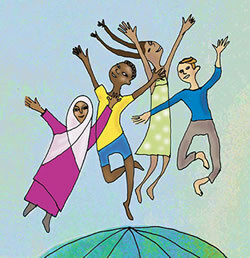 Please take a minute (and a minute is REALLY all it takes) to take the Kids Corner survey. You do not have to identify yourself (and there is no way you can be identified by the webmaster). The Kids Corner is trying to be the best that it can be, and your input is needed. If you have something on your mind, this is the time to speak up! Just click here and take the survey - it would be a big help to the Kids Corner webmaster! Thanks. Just when the webmaster thought she'd mastered translating Jackie news from the Chinese news sites, he goes to South Korea! Translating from Korean is a whole different story. Please forgive any errors. It seems that Jackie has been touring South Korea with (and sometimes without) The Myth co-star Kim Hee-Sun. Here are some photos, all of which come from the Korean Yahoo site and Yonhap News. In our Sharing Corner you can read a story from the imagination of Jordan Ryan from the UK. Enjoy! Simon Thompson from UK's Capital FM tells ComingSoon.net exclusively that director Brett Ratner has revealed the new location for New Line's Rush Hour 3, which is expected to cost up to $115 million. The original Rush Hour, made for just $33 million, earned $244.4 million worldwide in 1998, while 2001 follow-up Rush Hour 2, with a budget of $90 million, pulled in an impressive $347.3 million around the world. We've learned that Chris Tucker's Detective James Carter and Jackie Chan's Chief Inspector Lee will be heading for France, where both heroes will be "fish out of water". It was recently reported that New Line is waiting for Tucker to sign off on a script for the film. The actor hasn't starred in a film since Rush Hour 2. Ratner directed After the Sunset, with Pierce Brosnan, Woody Harrelson, and Salma Hayek, last year. 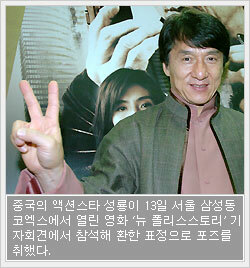 Click here (just click on the button below Jackie's photo on the page) to view a Korean news report about Jackie. 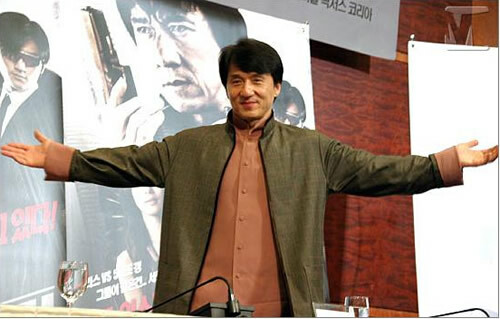 It seems to be about Jackie's past work with Korean actors. 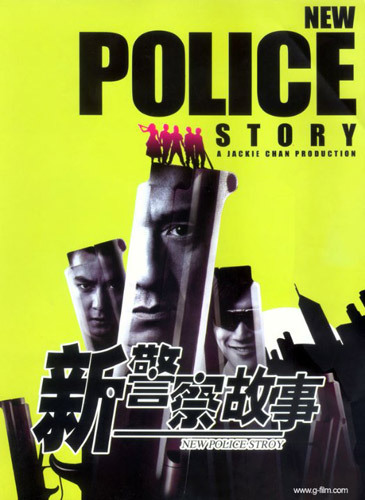 It's neat because there are clips from New Police Story, Accidental Spy, and Rush Hour, among others. It also shows Jackie at a few different news conferences. 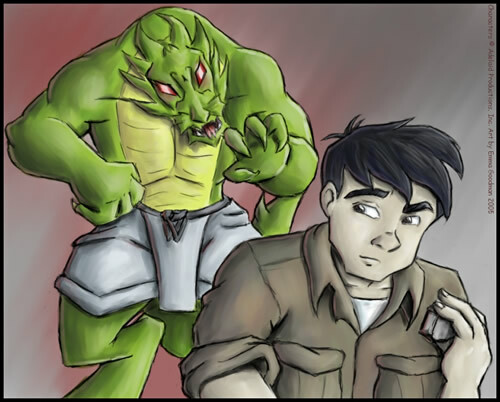 This drawing was made by Emma Goodman and shows Jackie with the evil Shendu. Thanks to Emma for sharing her drawing with the Kids Corner! 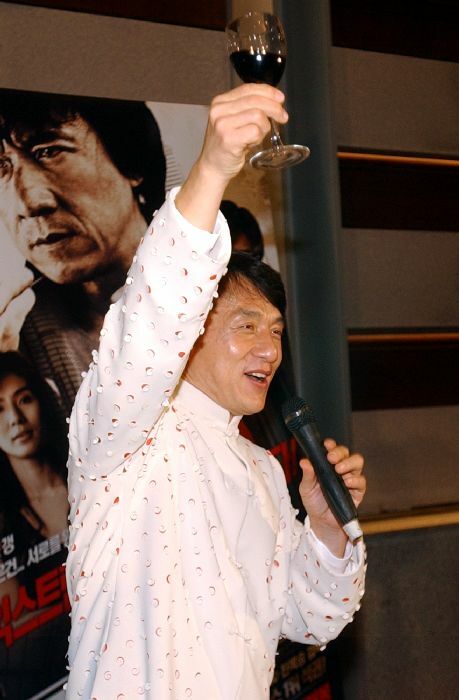 New "Jackie Chan Movies That Weren't"
CLICK ABOVE TO SEE NEW MOVIE POSTERS FROM AARON! 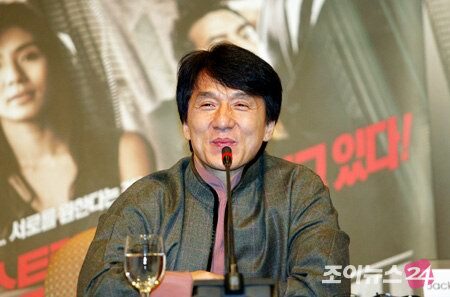 Jackie smiles widely at a press conference in South Korea, where he was promoting New Police Story. Jackie looked happy and well-rested in all the photos from this trip. Click here to see an album of photos from Korean news sources (mostly Yahoo Korea). 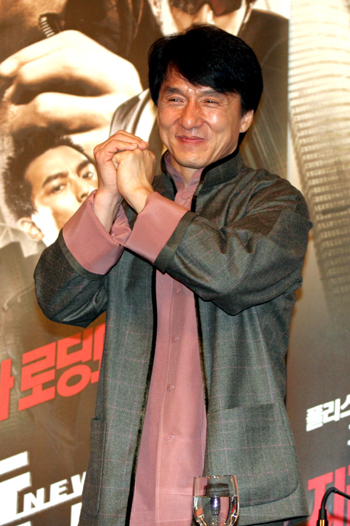 On his way home from the United States, Jackie stopped over in South Korea to promote New Police Story. (Photo: Sina) While there, he took part in a demonstration match with Li Jing Kui. Lots of new Buddies came tumbling onto the Kids Corner site last night. 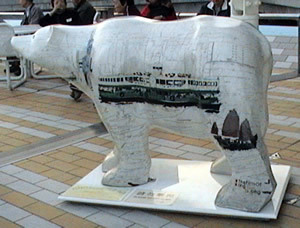 There are also a few Buddy Bears that were "lost" and are now found. Just go through all the pages and see if you can spot the ones that were on the site briefly, then disappeared and now have reappeared! Just click on Sara's Rainforest Buddy to see them all! The concert was a huge success, and they reportedly had earned over $10 million by 7:00 PM. Jackie could not attend this event, although he did help organize it and gave tremendous financial aid to put it all together. 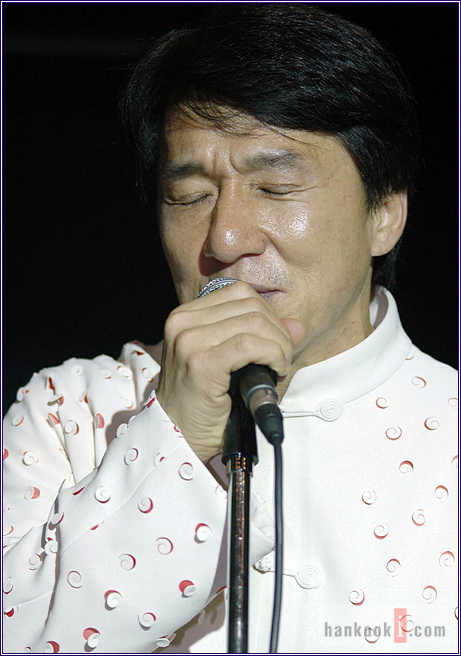 Jackie appeared at the concert via a taped message. 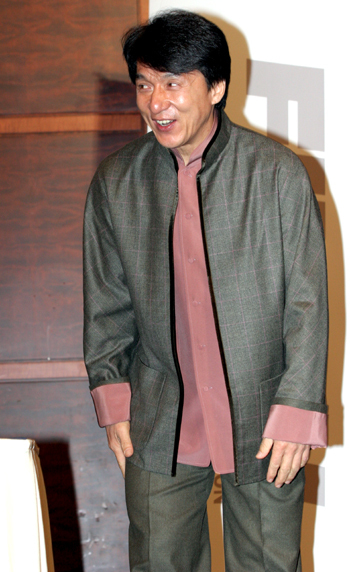 Action star Jet Li was also there, telling the story about how he and his family were nearly swept away by the rising waters. 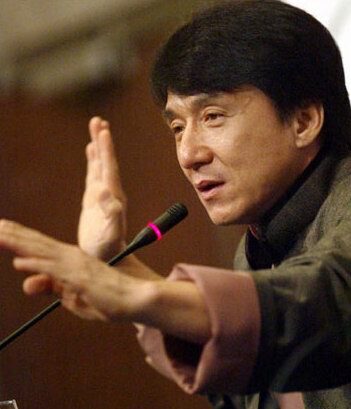 Jackie has spoken many times of his hope that he could bring people from all nations together in friendship. The Kids Corner Forum has done exactly that. Jackie will be so proud! If you would like to join the fun, just visit the forum. You do not have to register, but there's no reason not to. It doesn't cost anything and it is SAFE. The Kids Corner Forum is moderated by two caring adults, both of whom work with children as a profession. Kids will be safe at the forum. So join now! The more, the merrier! Click here to visit the forum. There's a great website for Jackie Chan Adventures fans. This site has episode guides, cast information, episode reviews, etc. Click Jackie and Jade, below, to visit! Awesome New Buddy Bear Designs! Click Lika's Buddy Bear to see all the new ones! Also please consider sending any drawings or stories you have. The Kids Corner is ALWAYS looking for new things to add to the Art Gallery, the Sharing Corner, and the Little Dragon Newsletter. The webmaster is also interested in putting together a section of the website for poetry (for Kids and Adults), so if you have a poem, please send it in! Remember, a poem doesn't have to rhyme, so don't worry if yours doesn't. If you don't believe that, then check out the work of a few third graders who wrote poems without any instruction or guidance. Most of their poems don't rhyme, but they're still amazing. As you have probably read here (and everywhere else in the world), a group of Hong Kong singing artists have joined together to remake the Michael Jackson/Lionel Richie song that was originally the theme for the Live Aid hunger relief concert. There are several versions of this song and there are many different versions of the video that accompanies the song. These videos, however, show some disturbing images and therefore they won't be posted here. There is one video which shows the singers (including Jackie) practicing the song. You can watch that by clicking here. ALL PHOTOS ©2004 JCX and are used with permission. Jackie demonstrating one of the JC Xavix products. Check out his t-shirt! Jackie talks to a Xavix representative. Jackie with the Xavix Golf. A lucky lady gets to try out the product while Jackie looks on. 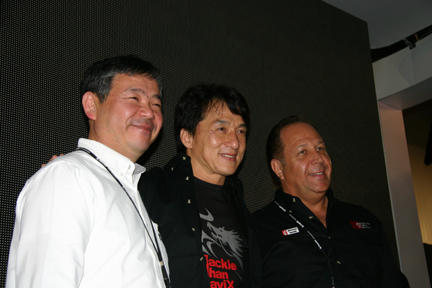 Jackie was in Las Vegas introducing his newest venture - the Jackie Chan Xavix. It is an interactive video/excercise/entertainment system. 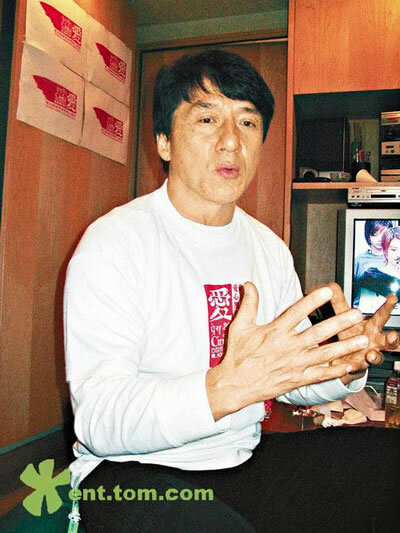 There are demonstration videos at the Jackie Chan Xavix site PLUS there's video of Jackie talking to the press and showing them how to use his own product! (If you look carefully, you can see Willie in the background.) Jackie talks about his goal of "getting kids moving" because he thinks they spend too much time sitting in front of computers and video games. So he's developed what looks like a really fun way to exercise! Click below to get to the video menu page. Little Dragon News is Online! HONG KONG: Some of Asia's biggest names in show business, including action movie star Jackie Chan, kicked off a marathon charity concert here yesterday to raise funds for survivors of the world's deadliest tsunami. Thousands of fans began trooping into the Football Stadium shortly after noon for the seven-hour variety show, which showcased many well-loved singers who have not performed in public for years. The Crossing Borders concert began with the screening of a video showing some of Asia's best-loved stars like Chan, Andy Lau, Miriam Yeung and Teresa Carpio recording the song Love, which is the Chinese version of We Are The World. Michael Jackson and Lionel Richie wrote We Are The World in 1985 to raise money for famine-struck Africa. Tickets to the show were free and it was also broadcast live across the region. Long disbanded bands, like Grasshoppers, and wildly popular girl and boy-bands belted out love ballads. Many wore white, the Chinese colour of mourning. 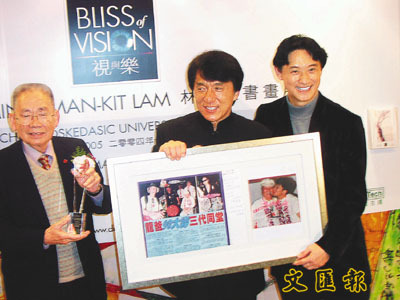 Big names like Leon Lai appeared within the first hour of the show, delighting his many fans. 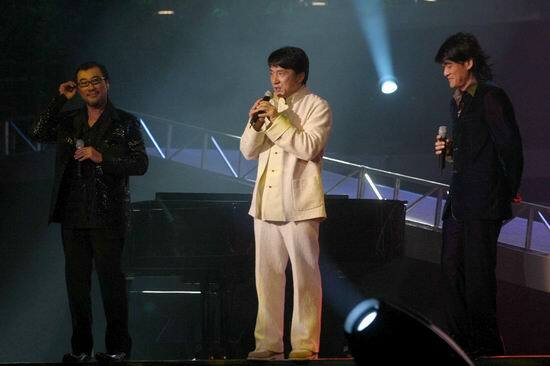 Taiwan's Jay Chou, Chang hui-mei and boy-band F4 were also in the line-up. Hosts urged fans and television viewers to donate generously by calling donation hotlines. Now is the time to give generously, one host said. The show is the latest in a string of private sector initiatives here to raise funds for survivors of the Dec 26 tsunami, which killed over 150,000 people in Asia and Africa. The catastrophe has left no one untouched and ordinary people from across the territory have dug deep. Over the weekend, hawkers donated vegetables and shoppers paid as much as HK$1,500 (RM731) for a small bag of lettuce, with the proceeds going to help the relief effort. More than 760 prisoners in the high-security Stanley Prison, where some of the most hardened criminals are locked up, donated HK$141,788 (RM69,175) on Thursday after learning of the catastrophe on the news. The territory's administration, which was criticised for acting too slowly after the tsunami, has pledged HK$17mil (RM8.29mil). 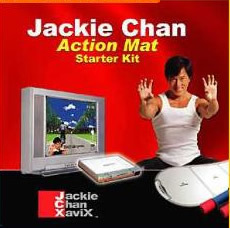 The Action Mat challenges users to build endurance and speed as they learn the skills and foot work to keep up with Jackie. 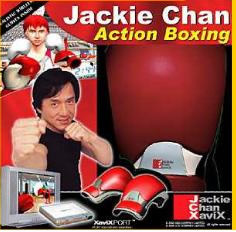 Action Boxing utilizes wireless Action Boxing Gloves to allow players to block, weave and punch their way to the championship title. These products should be available by the summer. Click one of the images below to visit the website! CLICK HERE TO READ THE WHOLE PRESS RELEASE! HONG KONG (AFP) - Over 150 Asian music and movie stars, a majority of them from Hong Kong, will join forces in that Chinese territory for a huge fund-raising show to help the Asian tsunami relief effort. Four popular Hong Kong singers Andy Lau , Jacky Cheung , Leon Lai, Aaron Kwok -- known locally as the four Gods of canto-pop -- are set to headline the show. Chinese action star Jet Li, who and his family narrowly escaped the disaster when they were on holiday in Maldives, will also share his story of survival. Thailand action star Tony Jaa, who starred last year in surprise international hit movie "Ong Bak", is expected to appeal cash donations. Jaa, whose home country is one of the worst hit areas by the disaster, said he was grateful for donations his country had received. "No one wanted disasters. But then this has made people realise how important life is. Everyone should learn how to enjoy life and give the others care and warmth," he told Hong Kong-based newspaper Apple Daily. 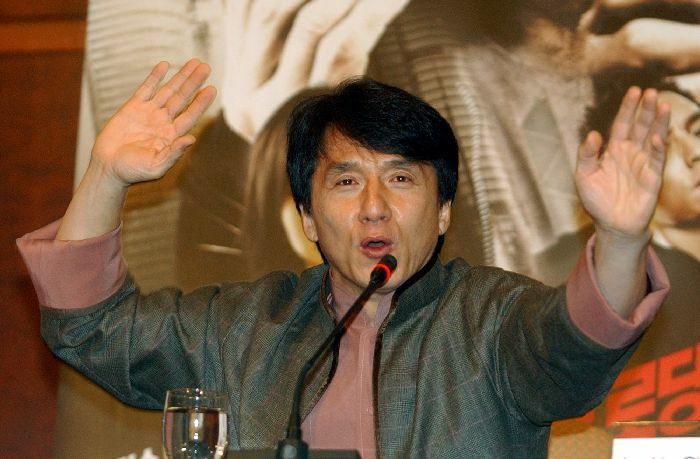 Hollywood action star Jackie Chan, one of the conveners of the show, will not be able to attend due to a prior engagement in the Unites States but will raise funds by telephone. 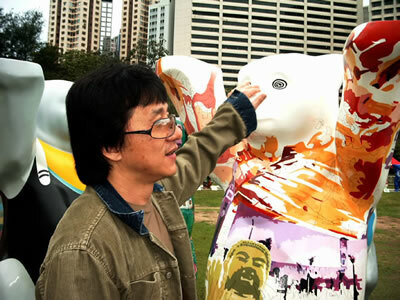 Other celebrities, such as actor Chow Yun-fat and Maggie Cheung, are yet to confirm. The seven-hour show, "Crossing Borders Fund Raising Show" will be held at the Hong Kong Stadium from 4pm (0800 GMT) to 11 pm. 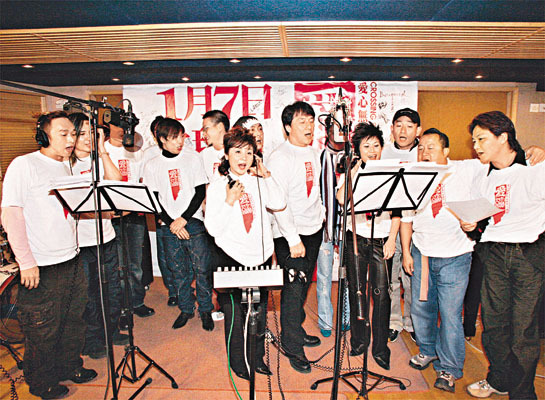 More than 100 singers from Hong Kong, the mainland and Taiwan have recorded the show's theme song, "Love", a Chinese-language version of "We Are the World", originally released by USA for Africa in 1985 in aid of African famine relief. All major TV stations in Hong Kong, Taiwan, China, Singapore and Malaysia will broadcast the show live and are expected to draw over 100 million viewers, organisers said. Over 150,000 people were killed and several million left homeless or hungry after a massive earthquake deep below the Indian Ocean off Indonesia on December 26 sent huge waves crashing into coastal communities in 11 countries. In 1985 some of the world's brightest singing stars recorded "We Are The World" as the theme song for Live Aid, a concert to benefit hunger victims. Now, in the wake of the worst natural disaster in human history, some of Hong Kong's brightest stars, including Jackie, have redone the song and are releasing it to benefit the victims of the tsunami. 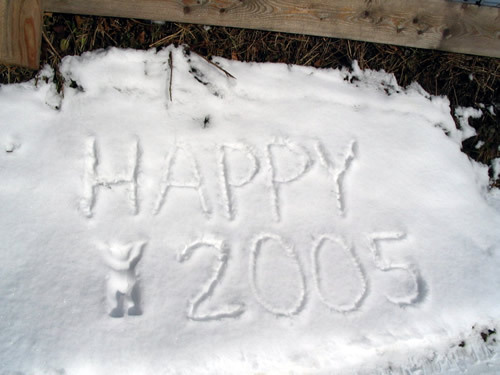 Eva sent the adorable photo, above, to wish all Buddy Bear fans a Happy 2005. Thanks Eva! ...with a couple of hundred thousand other people! 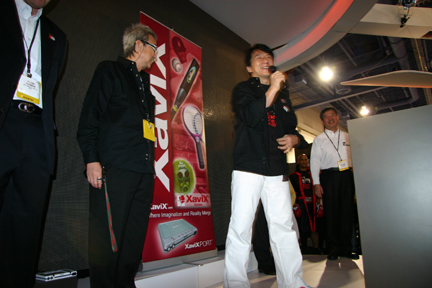 It's the annual International Consumer Electronics Show; the worlds largest annual consumer technology exhibition. 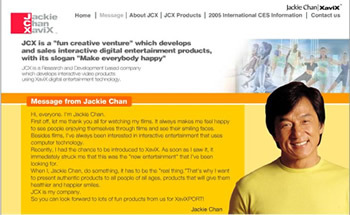 Jackie is scheduled to appear with SSD COMPANY LIMITED/XaviX and announce a strategic alliance with Jackie Chan. SSD XaviX is a cutting edge technology company that makes products that allow users to "interact with their televisions like never before." They also make games for their system. We can only wonder what the "alliance" with Jackie will be. Very exciting! 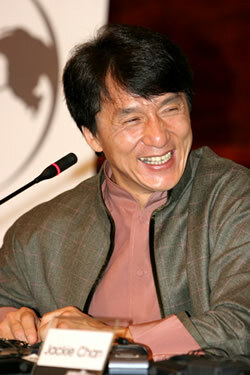 ...Jackie was the "Friends of Operation Smile" Ambassador a few years ago. You can still assist these children by clicking on Jackie, below, and seeing what you can do to help. Thanks to Haarsha for sending the Kids Corner a photo of Jackie's "other" Buddy Bear. She says that both the tall Buddy Bear and the short one are standing outside Jackie's JC Jeans store on the Avenue of Stars. Jackie's son Jaycee has gotten involved in an effort to help raise public awareness in Hong Kong. 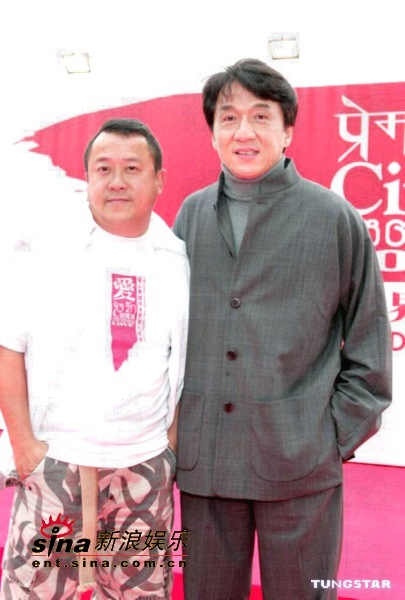 Along with actor Eric Tsang, Jaycee is getting the word out to Hongkongers about what is going on in the tsunami disaster areas. He has also offered to travel to the affected areas to lend a hand. It looks like Jaycee is starting off on the right foot when it comes to charitable works. Jackie will surely be proud. Thanks to Mary D. for this information. While some are helping tsunami victims through their wallets, others have taken a bigger step and volunteered to help out where the disaster struck. Actress Cecilia Cheung Pak-chi has said that as a representative of the Hong Kong Actors Guild she will go to the worst hit part of Indonesia tomorrow to help those in need. When asked if she had been vaccinated, Cheung said: "I decided not to take the shots because of a risk of fever and I don't want anything to get in the way of my task." 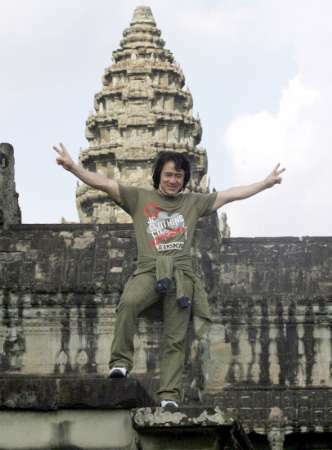 Jackie Chan's son, Jaycee Fong Cho-ming, is already offering his help at Khao Lak, where a temple holds 1,600 bodies. 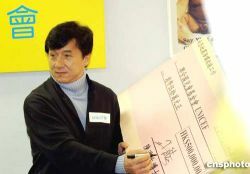 Jackie Chan, who donated $500,000 to the tsunami victims, said Fong's donation of one dollar less than his "gave him a scare". Cheung and Fong are taking part in a programme organised by veteran actor Eric Tsang Chi-wai to let Hongkongers know what is happening in the disaster area. This is a photo of Jackie with the Buddy Bear that he purchased. United Buddy Bears official photographer, Doris Rieck, took some great photos of the bear (including the one above). 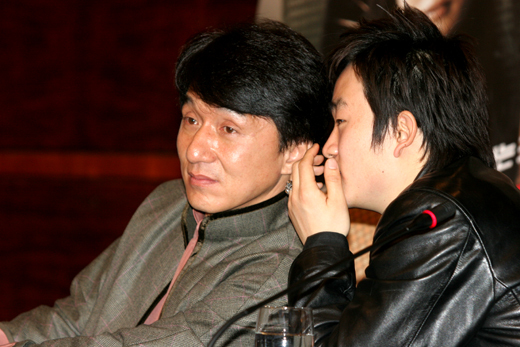 CLICK HERE to see a great photo album of Jackie Chan's Buddy Bear! New Kids Corner Forum is a Great Success! The new Kids Corner message board is quickly acquiring many members. This board is much better than the old one and allows members to post photos and links. The board is divided into categories and visitors can choose what they'd like to read about and comment on. Please visit the new board - we're having a lot of fun over there! Jackie was on a program called "The Artistic Life." 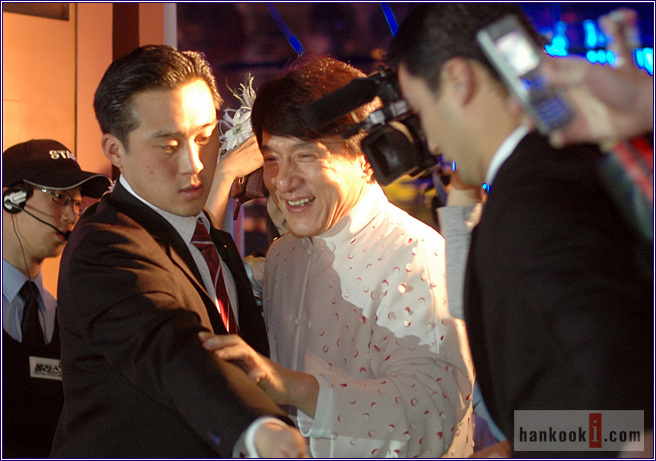 According to Sina, Jackie talked about his life and gave a young actress a big hug! 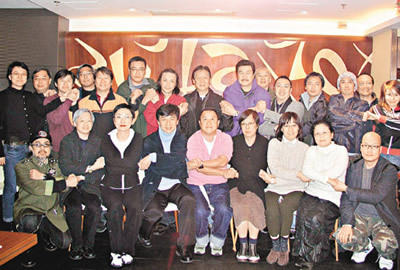 The brightest stars of Hong Kong join together to help others. "...Jackie Chan, Joey Yung, Nicholas Tse, Jaycee Chan [ Fang Zuming ] and so on the well-known entertainer positively will attend the large-scale benefit performance..."
There are many plans in the works to raise money for the victims of the devastation. 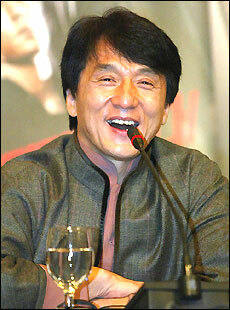 Jackie has also been involved in organizing a fundraiser which will tentatively take place on January 7, 2005. However, Jackie is scheduled to be in Las Vegas on that date, so he will probably participate via a video link or taped speech. Well, it's not really NEWS, but it's just a few new pages on the website. One lists Jackie's favorite stunts and the other lists his favorite fights. 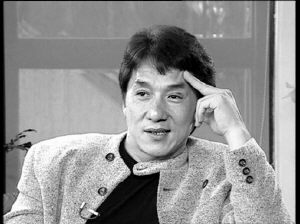 All information for these pages came from the book I Am Jackie Chan, published by Random House. Here he is again donating winter coats to charity. 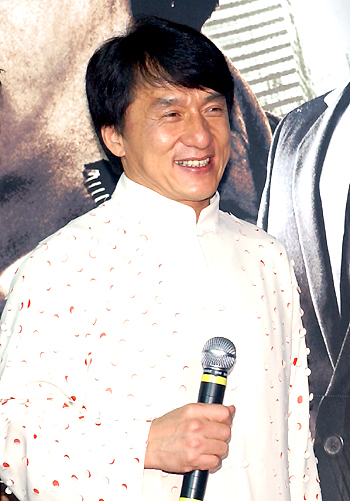 When Jackie is between films, or when there is a break in filming, he gives his all to helping others. Just another reason why we love Jackie. 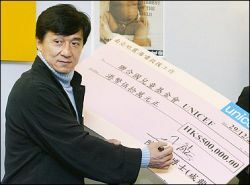 As soon as possible, Jackie jumped right in and donated HK$500,000 (US $64,000) to help the victims of the tsunami. 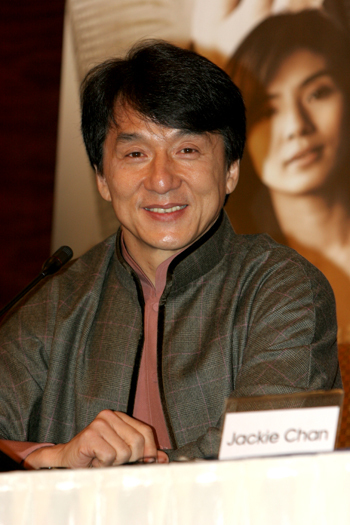 Jackie said that if we all give what we can, "the accumulation of droplets becomes a river." All photos, below, can be enlarged by clicking on them.